The Singapore General Hospital (SGH) Diagnostic Bacteriology section’s official blog had recently described the change in healthcare-associated MRSA (HA-MRSA) clones in our local hospitals, with a shift from a near-complete monopoly by ST239-MRSA-III to a duopoly between the older clone and ST22-MRSA-IV (or UK-EMRSA-15) within a period of 10 years from 2001 to 2010. Number (inferred) of ST239-MRSA-III and ST22-MRSA-IV clinical isolates at the Singapore General Hospital over time. Note the overall fall in the number of MRSA isolates since 2008 as a result of better infection control measures at that hospital. 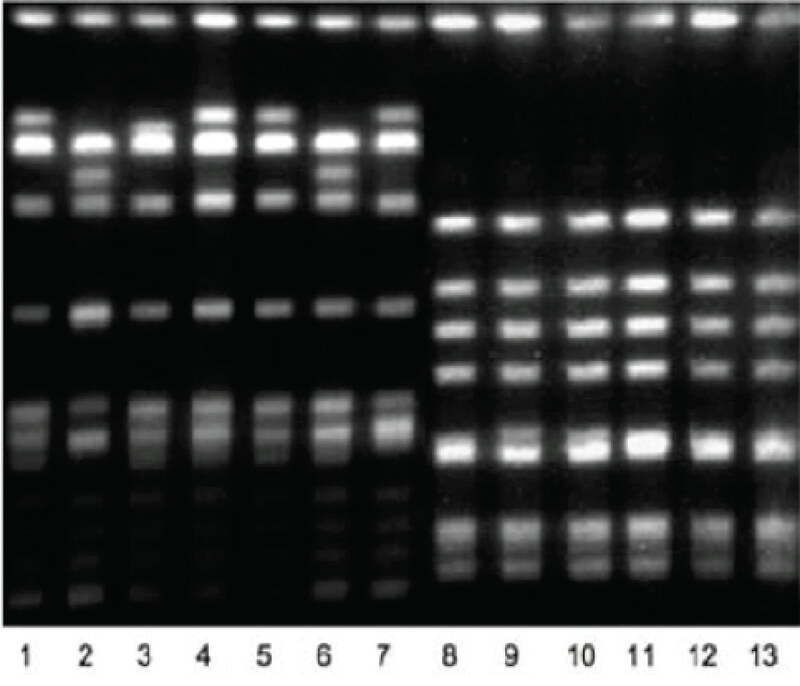 Pulsed-field gel electrophoresis image showing the DNA band patterns of local representative strains of ST239-MRSA-III (Lanes 1-7) and UK-EMRSA-15 (Lanes 8-13) after SmaI digestion. What were the factors that made UK-EMRSA-15 more successful in the Singaporean hospital setting compared to ST239-MRSA-III? How did the competition (for surely it is an ecological competition for human hosts) affect both of these isolates? How do the MRSA from different local hospitals interact – was it primarily separate evolution in each hospital (thinking of each hospital as an “island”) or was it more interlinked? When the opportunity came in the form of an invitation from Prof Sharon Peacock (her rise has since been meteoric and she is due to be the founding director of the Bloomsbury Research Institute) to spend a year at the Wellcome Trust Sanger Institute, generously funded via the NMRC Research Fellowship, we felt that we would be able to answer some of these questions using next generation sequencing technology to describe and compare the entire genomes of a large collection of ST239-MRSA-III and ST22-MRSA-IV isolates. I am extremely grateful to my long-time collaborators – the microbiologists of SGH (the chief blogger of the SGH Diagnostic Bacteriology section’s blog), Tan Tock Seng Hospital (TTSH) and Changi General Hospital (CGH) – for digging out from frozen storage blood MRSA isolates (i.e. obtained from patients with MRSA bacteraemia) obtained during the past decade and providing them freely for the study. 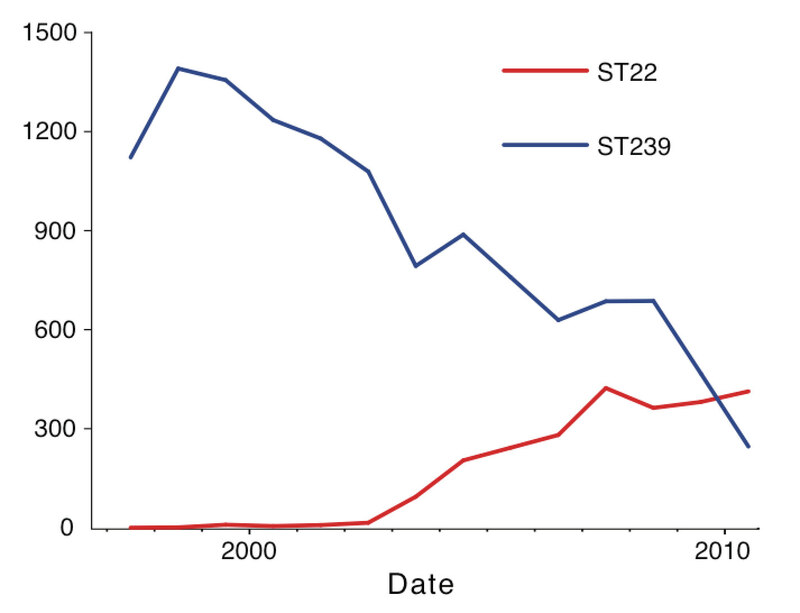 Although the two MRSA clones occupied the same ecological niche, and such clones are known to “share” genes, there was hardly any exchange of genetic material between ST239-MRSA-III and ST22-MRSA-IV in Singapore over a decade. This is perhaps best visualised in the diagram below, which can also be found in the original paper. Note from the figure that ST239-MRSA-III (above) and ST22-MRSA-IV (below) have virtually different sets of resistance and virulence genes. 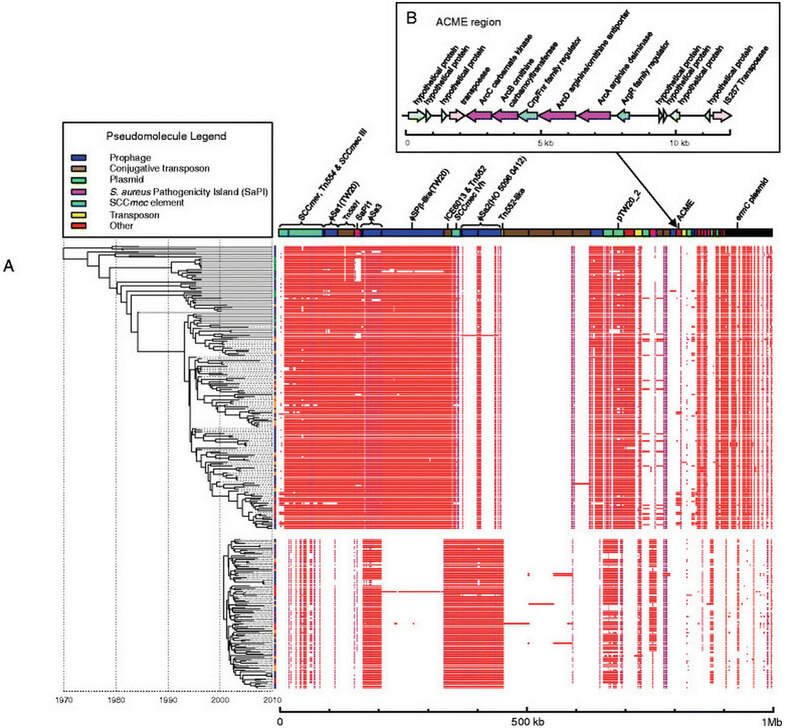 Another figure from the original paper, showing genetic elements such as resistance and virulence genes. ST239-MRSA-III isolates (above) and ST22-MRSA-IV isolates (below) largely do not share similar resistance and virulence genes. Note also the presence of the ACME element – found only in several of the later ST239-MRSA-III isolates. The increased ecological pressure (i.e. competition) from ST22-MRSA-IV probably resulted in ST239-MRSA-III responding via the acquisition (several “episodes” independently) of the arginine catabolic mobile element (ACME), a mobile genetic element originally from other types of staphylococci that has contributed to the success of other MRSA clones by permitting them to survive on human skin for longer periods (and hence easier for the purposes of transmitting between humans). Perhaps most importantly from a clinical perspective, in terms of MRSA evolution, all the hospitals in the study (TTSH, SGH and CGH) were interlinked. There was no evidence of independent evolution of either MRSA clone even in “far-off” CGH (Singapore is a small country!). What this means is that both clones of MRSA were transferred relatively freely between hospitals. This is easily understood and appears intuitive: patients do transfer frequently between hospitals here in Singapore, and the same with hospital staff. Between 2000 and 2010, I have worked at 3 different hospitals in Singapore, and I am sure the same is true for many healthcare staff. Medical officers used to rotate postings every 6 months (and house officers every 4 months), often to different hospitals – this has recently changed with the advent of the residency program, and before that with the hospital cluster system, but perhaps not enough to limit the transfer of MRSA and other drug-resistant pathogens between hospitals to any significant degree. A related point which probably needs to be tested but appears intuitively correct is that for MRSA control in Singapore to succeed, it should not be viewed and implemented as individual efforts at various hospitals, but a concerted and coordinated effort. Or else hospitals with high rates of MRSA in Singapore will always be “at risk” of transferring their strains to other hospitals locally. The Dutch have had a similar experience with their national “search and destroy” MRSA strategy. A final but not minor point – because of multiple international research collaborations, there was a large number of ST239-MRSA-III and ST22-MRSA-IV genome sequences available at the Sanger Institute, and we had placed the Singaporean MRSA genomes within this global collection in order to determine how they had evolved within the global context. What we found to our surprise was that the original source of a large ST239-MRSA-III outbreak at St. Thomas’ Hospital in London between 2002-2004 was most likely Singapore, given the current available genomic data. This is not physically implausible, as local healthcare staff frequently travel to other international institutions for exposure and training, and patients occasionally transfer between our hospitals too. It certainly reinforces the lesson (albeit in a different way from influenza and SARS/MERS-CoV) on how easily pathogens ignore borders and transfer between countries, given the ease of air travel.